There is need of more positive narrative around refugees. The national and international panorama daily pressures for the doom and gloom incoming with the massive waves of foreigners. Welcome to the UK is a response to all of this, stemming from personal experiences and a humorous take of current affairs and of the often cynical society we live in. 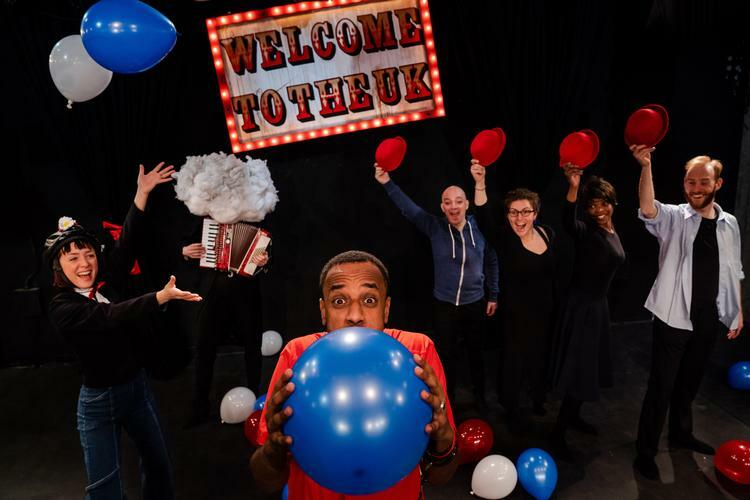 Starting from a common factor – the dream each one of us has for a happy future – the show develops in a fun fair format, featuring the ups and downs of refugees seeking asylum in the UK. Many British stereotypes and recent alternative facts are brought together in a rollercoaster of effervescence and eccentricity. A blown-up caricature of Theresa May jerks on the stage playing the accordion. People from Syria, Zimbabwe, Afghanistan are bounced back and forth, in and out of the Home Office, while juggling multiple jobs or trying to survive through hunted houses and acting attempts. The public opinion is overwhelmed by the bad weather while disgusted – rather annoyed indeed – by the requests of so pretentious migrants. The exaggeration comes into being from sadly real episodes, the dismal route asylum seekers have to go through in order to be accepted by a country which apparently is thrilled to ‘welcome’ them. The arrival in the UK is not always the end of their pain and struggles, but actually it is an admin labyrinth made of exhaustingly long periods of uncertain waiting. An interesting scene tries to capture the passive stand-by interval migrants are forced to. There are few interactive sequences with the audience, especially at the beginning, which add to the engagement of the show. Music and sounds sustain the transitions from one scene to another, adding to the entertaining variety. The use of a wide range of colourful props is a bright original expedient. The lack of a connecting thread, though, leaves perplexed and often lost in the succession of episodes. There are only a couple of storylines that carry on more or less from start to finish, but it would have been interesting to give them some extra space and deeper exploration, also in order to balance more the alternation of drama and comedy. This latest, in particular, is not always successful because of isolated moments already often ridiculed in the public eye, that it is too fresh to find them amusing again. The best parts come, instead, when the hyperbole is so high that the creativity and the mimicking talents of each performer is more profuse, such as in the interview with the Home Office or the Shakespeare’s mash-up. Welcome to the UK is at The Bunker until the 16th February.